It was always easy to take Futurama for granted. It never experienced the easy path of success like its creative cousin, The Simpsons, or the bro-love bestowed upon the other rescued animated series, Family Guy. Futurama was the odd duck of animated shows: unabashedly smart, authentically nerdy, often hysterically funny and cancelled/resuscitated more times that most show can even dream about. For those that have stuck with it over seven years and 140 episodes, Futurama was one of the last bastions of sci-fi storytelling, space exploration stories and high-brow/low-brow comedy. Tonight, Comedy Central will air Futurama’s last original episode “Meanwhile” at 10pm EST featuring Fry (Billy West) and Leela’s (Katey Sagal) wedding. Will it really be the end? It’s hard to know with this series since death has been fleeting in its history, even in its frequency. However, we talked exclusively with long-time executive producer/writer David X. Cohen about some of his favorite memories working on Futurama, the characters that have a warm place in his heart and Futurama’s return in a special The Simpson’s episode next year. Futurama really is a show that remained consistent despite its crazy inconsistent existence. Why do you think that was? Yeah, people were nervous when we came back but we brought back the same writing staff, the same cast, animators and composers. I don’t think the show took a step down. I think we improved and we got better at telling good stories. Everyone has their different opinions, but it seems pretty clear from the fan reaction that we kept consistency. Reflecting on the entire run of the series, which recurring characters were some of your favorites? Usually I think of the real side characters, the tertiary characters, which are the characters that when we invented them did not intend to have them back ever. The actors have about one minute to win the writer’s hearts. A couple of those are Hedonism, the solid gold robot who performs every kind of hedonism. He was voiced by MauriceLaMarche who won the Emmy for Futurama the last two years. He did such a hilarious performance he kept coming back. Ditto, even more so for Roberto, the homicidal robot, who Frye first met in a robot insane asylum. He carried around a knife stabbing everybody making the deafening “HAHA!” He was played by David Herman. At the first table read, he unexpected came up with that sound and delivered it at about 180 decibels which caused the room to break down in laughter. I credit the actors in the situations where they made a very tangential character so great they came back. Which celeb guest spots are some of your favorites? We also got Adam West and Burt Ward so we managed to get great sets for the collector mentality. One other favorite was Bea Arthur as the Fem-puter who ran a society of giant Amazon women. It was such a crazy casting idea. She would never be the first person you would think of casting in a sci-fi cartoon but she came in and was so good. She took it so seriously and delivered it in such an important sounding way. 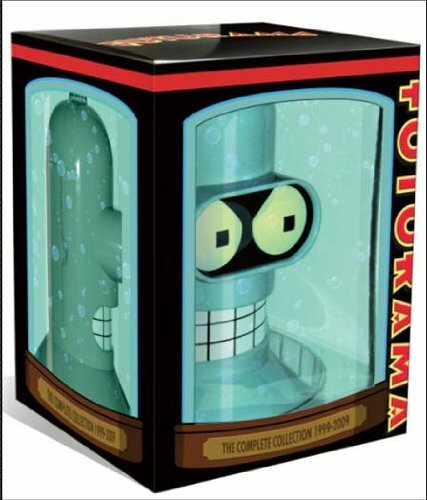 It always kills me to this day, plus seeing Bender doing a love scene with Bea Arthur. It’s always stuck in my mind. Futurama was one of the most scientifically authentic shows on television. Is there a nerd inclusion in the show that makes you especially proud? About two years ago, (executive producer) Ken Keeler constructed an actual mathematical theorem in our brain switching episode, “The Prisoner of Benda.” It wasn’t clear if all the characters could back to their actual bodies. When we were thinking about the story we asked if it was even possible to get their original brains back. Ken, who has a PhD in Applied Math, proved the theorem that you could get your original brain back as long as you introduced at least two new people into the brain switching process. So the Professor, with the help of the State’s Harlem Globetrotters, proved it in the show. We even flashed the proof of the theorem at the end of the episode. You would not see that in another sitcom. Take that The Big Bang Theory! And Eric Kaplan has been writing for The Big Bang Theory for years now so we have a little bit of crossover. There was a very limited market for our writers but he found it. Was there a story that you were happy to get to squeeze in before you ran out of time? Yes. The second to last episode gives Doctor Zoidberg, the biggest underdog of all, his own episode with “Stench & Stenchability.” Believe it or not a lot of fans have asked me over the years if Dr. Zoidberg will find love and the answer is yes, and she’s played by Emilia Clark from Game of Thrones. It’s her first voice over appearance. I’m a huge Game of Thrones fans. It appears to be the perfect match because Zoidberg is the smelliest creature on Earth and she’s born with no sense of smell. In the last episode long-time shippers of Fry and Leela finally get to see them get hitched. Was their love story ever problematic for you guys in the writer’s room? There was a period when we came back with the DVD movie where were concerned about Fry pursuing Leela. We were worried we’d be stuck in a holding pattern or it would box us in story wise. One of the movies was The Beast with 1,000 Backs, where David Cross plays a giant octopus who falls in love with everyone in the universe, we decided to have Fry fall for another women and then we were able to work our way back up to the big wedding finale. As always when Futurama is canceled, there’s immediate talk of more DVD movies or maybe even a big screen film this time. Can you see that happening? I think our stories are always basically a feature movie plot crammed into 22 minutes. The animation at Rough Draft has also evolved and it’s switched over to HD. When you blow up those current episodes in a theater, which we have done at the Fox lot, it looks amazing. It already looks like a movie to me so I don’t think it would take much to make a movie, but it would take some outside interest to bring the mighty forces back together. It does take a lot of effort to get it back and up and running again. Worst case scenario is the already announced The Simpsons/Futurama crossover episode coming next year. Can you tease us about what we’ll get to see? Stuart Burns, who wrote many classic episodes for us, is writing that crossover so fans can rest easier because someone who knows Futurama deeply is guiding it. It’s not a cameo appearance and it genuinely requires the cast to be there. They ran [the story] by me early on and I had some minor suggestions. Obviously time travel will be involved to get them in the same place at the same time but I’m going to shut my mouth now. What were your favorite Futurama characters or episodes? Let us know in the comments. Community ends the season with three brand new episodes tonight and the actors talk about the show's renewal. Seriously. Keep the show running.